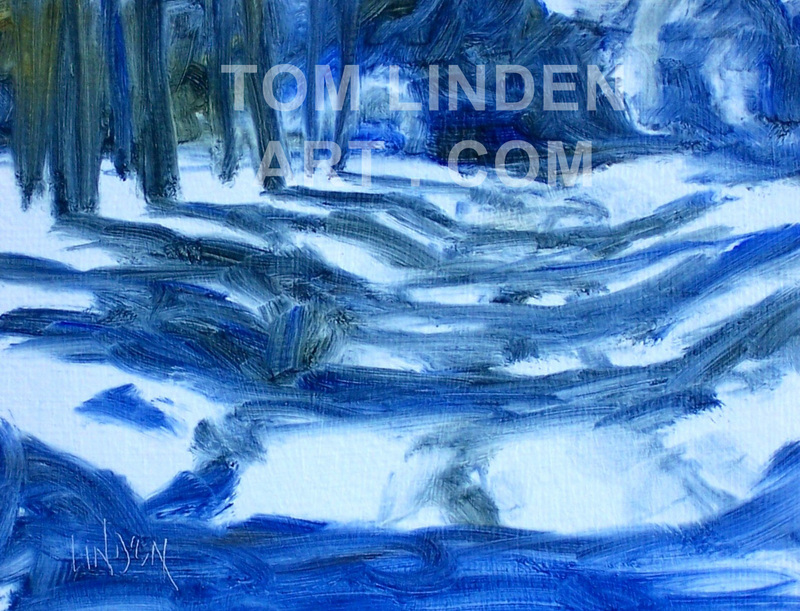 I had been painting out at the Nygren Preserves a few years ago. In between and even as I painted, I occasionally took a brief to photograph subjects of interest. Shuffling through my collection of photos, I came across a rather boring scene under an overcast sky. Not very interesting but something about the design caught my attention. It took a few weeks, but then it occurred to me that a more dramatic sky could make the difference. It worked in a small 14″x 11″ format and worked out well in the larger 30″ x 24″ format. 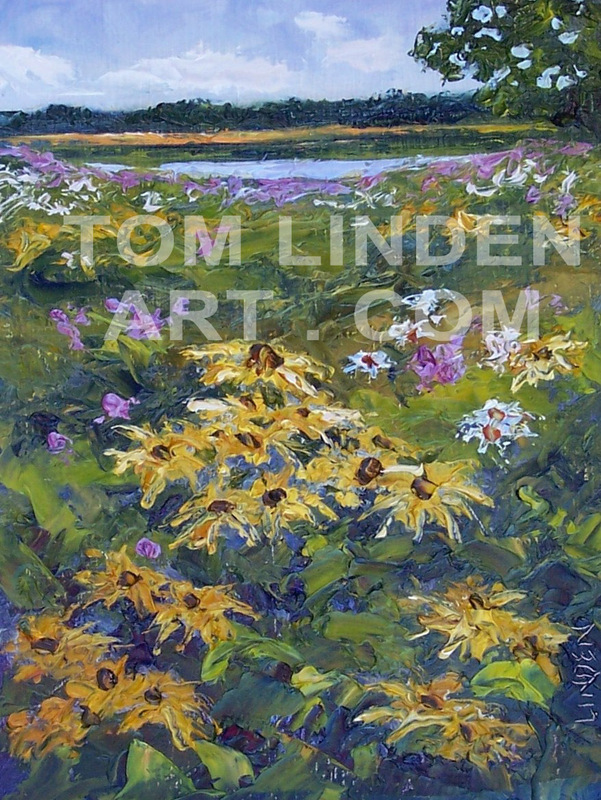 A couple summers ago, I was creating some plein air paintings at the Nygren Wetland Preserve. While I painted, my wife spent time exploring and gathering photographs. One of her photos was of me painting among the tall grasses. It took a couple years, but I finally decided to play with this design on a long canvas. I used a wash of Alizaron Crimson to tone the sky and a mottled wash of Transparent Red Oxide for the grass. Once these were in place, I applied body paint to finish of the painting. 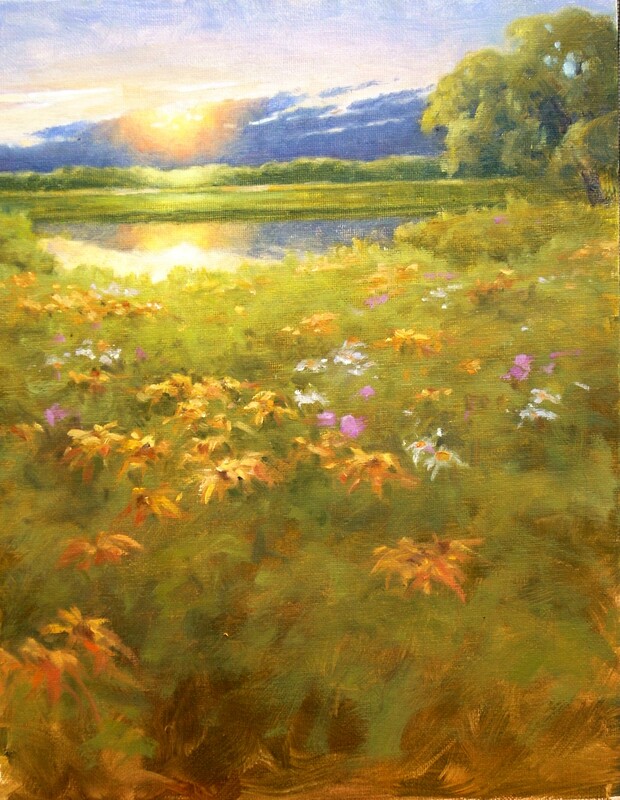 Nygren Morn, Oil on Masonite 12" x 24"
Several months ago, I created plein air works at Nygren Wetland Preserves. Several of the works are still at my studio. Occasionally, I place these works around the studio. They help to set a mood when I paint and often give me ideas for future works. One of the Nygren works caught my attention. I decided to play with the design and change the format. I also took on an additional challenge. Instead of canvas, I decided to work on a gessoed Masonite panel. Slick stuff. As I painted and adjusted to this different surface, I got lost in my work. Helen reminded me that we were expected at a friends house for dinner, and we should be leaving soon. I “needed” to get to a stopping point before I quit for the evening. It seemed that the harder I tried to hit a stopping point, the more elusive it became. Eventually I found a stop, quickly cleaned up my equipment, then myself. Made to the friends only a few minutes late. Great dinner, fun conversations, and then a game in which one of the friends present taught us a new spelling for the last name of the Pittsburgh Steelers quarterback – Rothslickburger. And you thought that it was Roethlisberger. 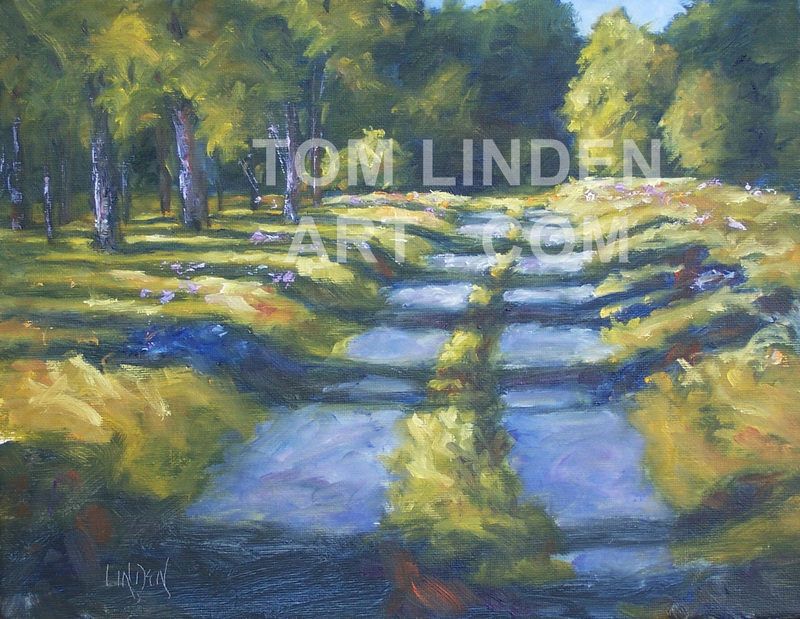 Nygren Path, Oil on Canvas 11" x 14"
Last Saturday I conducted an oil painting workshop at The Next Picture Show in Dixon Illinois. 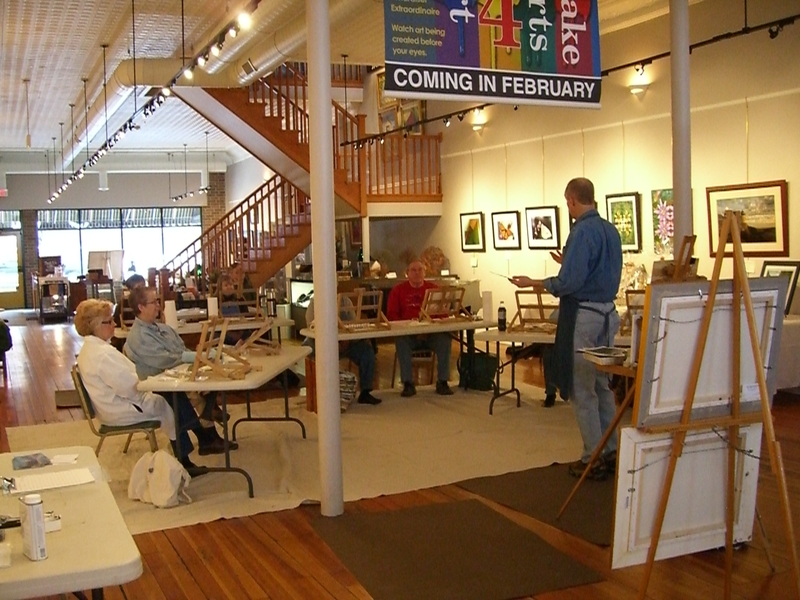 Bonnie Kime, the executive director, asked that I center the workshop on trees and shadows. After the winter which we have had to this point, I agreed that it would be a good idea to remind folks of warmer days to come. Driving down to Dixon was tough. As I stated, we have had a lot of snow and a lot of very cold days this winter. The weather has not been very conducive to plein air painting. It seems that when we have had relatively warm days, it has been cloudy or overcast, thus no shadows. The days that have offered bright sunshine and strong shadows have tended to be bitterly, if not dangerously, cold. 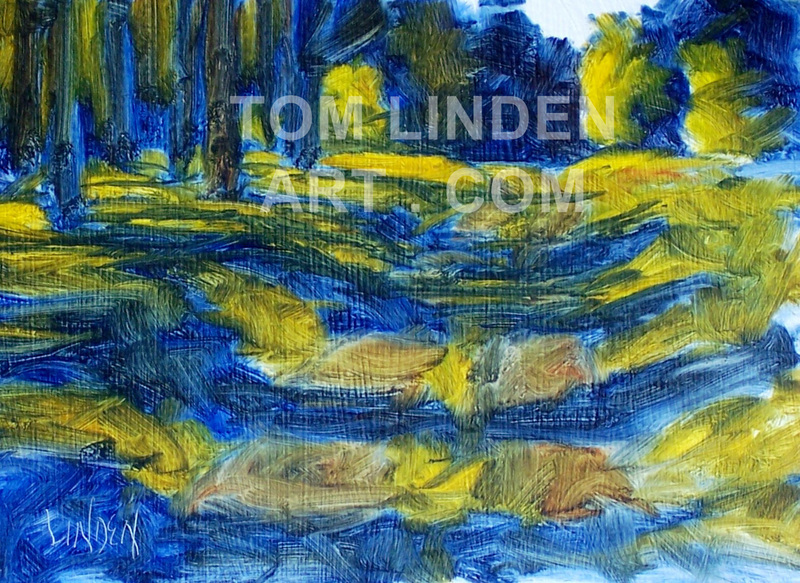 I am longing to get back outdoors to paint. This day, we were anticipating temperatures in the 30’s. The morning offered clear skies and bright sun. During the ride down to Dixon, I witnessed scene after scene which offered great painting possibilities. I wanted to be out painting. I arrived at The Next Picture Show and set up my gear. We were expecting ten to thirteen students for the workshop. We ended up with ten. They were a great group of artists and asked a lot of good questions. Really kept me on my toes. Several of the students were familiar with painting in watercolors and were trying to grasp the change to oils. Small talk while waiting for the rest of the students to arrive. I brought four of my plein air paintings as examples. Before the class I prepared a couple of small studies to illustrate how I advance from initial drawing through my initial block in. 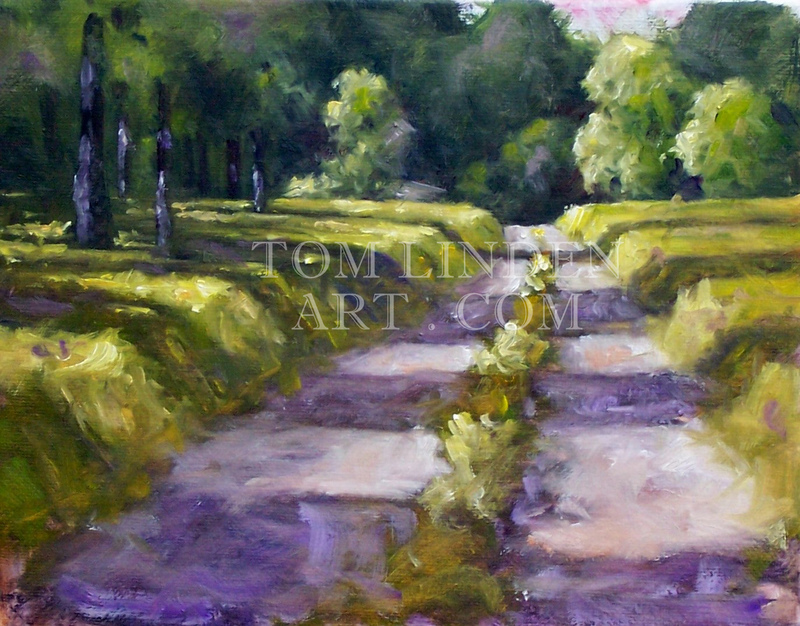 I used one of my plein air paintings as a model to create a demonstration painting. The demonstration moved swift and smooth. I finished the painting shortly before noon. The students broke for lunch and then spent the afternoon painting. It was fun working with the students. The most challenging moments occurred when students voiced concerns about their paintings. Moments when their confidence waned. Initially, I encouraged them to work through the challenge. They had good starts and were just in need of a few modifications. Eventually, when I feared that they might “throw in the towel”, I had to give into my temptation and punch up the focal points of their paintings. At a point, perhaps after the first few brushstrokes, they realized that their painting was taking on a life which they thought was not there. They realized just how close they were to getting it. An “Aha” moment. These opportunities really work my skills too. Love the challenge. The workshop ended, I packed up my gear and headed home. Quick clean up and then I took Helen out for our Valentines Day dinner and then dessert at Chocolate by Daniel. Oh yeah, I got points for that move. 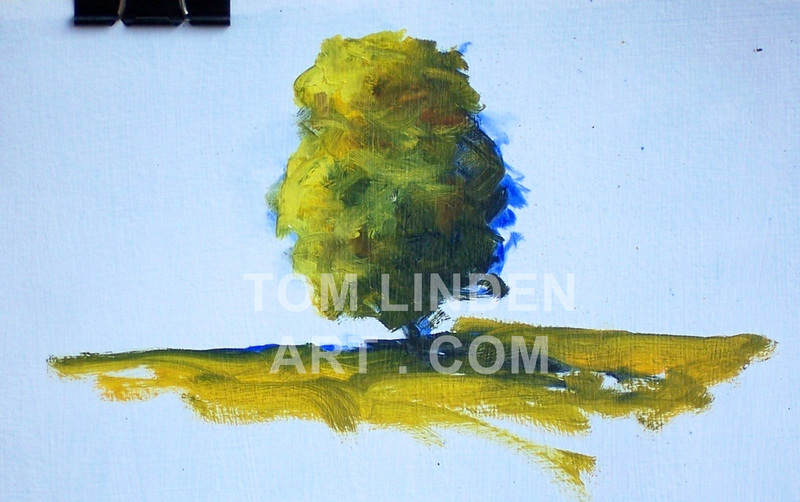 Quick painting (6" x 8") done for the students to demonstrate how to develop volume in a tree. A little 6" x 8" study to exhibit the drawing stage of my design. A small 6" x 8" study to exhibit the block in stage of my design. Nygren Florals, Oil on Gessoed Paper 8" x 6"
Cold, windy and several errands and tasks to complete so I decided to work on a small painting and then get to the other tasks at hand. I opted to work from one of the photos Helen took while we were working at the Nygren Wetland Preserves this past July. I sketched the scene and blocked in my initial colors. As I was ready to start applying body paint, I made a decision to abandon my brushes and work the painting using only palette knives. Perhaps not the best painting, but it was fun to play this way. You never know where it will lead. Hope it drys enough to frame and display at my exhibit at The Next Picture Show. Looking for a unique gift this Christmas season? 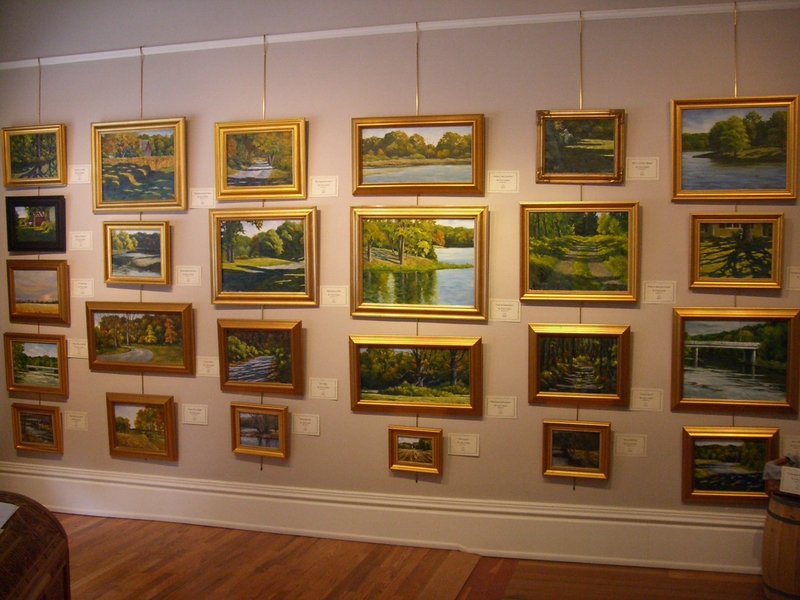 An exhibit of more than two dozen on my Plein Air oil paintings is on display and available for sale at The Next Picture Show in Dixon Illinois (www.thenextpictureshow.com). The gallery is located at 113 W. First Street in Dixon Illinois (telephone 815-285-4924). This display will run December 1 – 15, 2010. 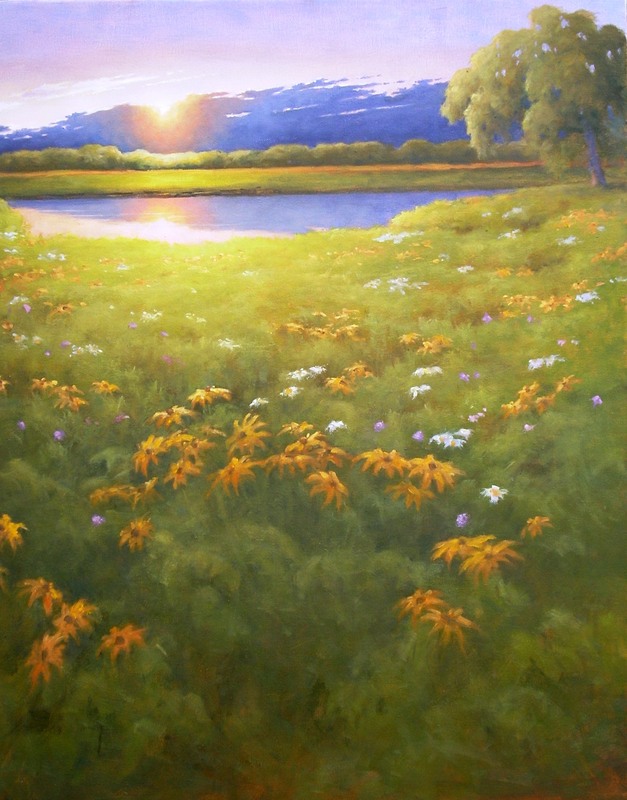 The two dozen plus framed original oil paintings on display were created on location (not in a studio) at various sites in Winnebago and Ogle counties. These works have a more impressionistic feel about them. In addition to the framed works displayed on the walls, more than two dozen miniature (6” x 8”) unframed works will also be available. These smaller works will make for great stocking stuffer’s this Christmas. You are currently browsing the archives for the Nygren Wetland Preserves category.